This is my review of the Plaza Premium Arrivals Lounge at London Heathrow Terminal 2. 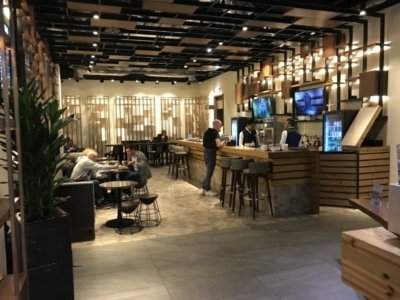 Regular HFP readers might recall my visit to the Plaza Premium Arrivals Lounges at Heathrow Terminal 4 and Terminal 3 a few weeks ago. 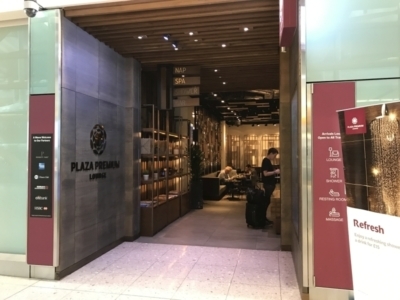 The Plaza Premium Arrivals Lounge at T4 (click for review) opened earlier this year and the Arrivals Lounge at T3 (click for review), in the old Delta space, had only been open for a couple of weeks when I was saw it. As I had some spare time after seeing those two lounges, I also asked to see the older Plaza Premium Arrivals Lounge in Heathrow Terminal 2. Three years ago Rob was invited to the opening party and he wrote a brief review then, but we hadn’t covered it since. The Plaza Premium Arrivals Lounge at Heathrow Terminal 2 is located next to the exit from the customs area. It is far easier to reach than the Terminal 4 (up the lift or escalator to the mezzanine) and Terminal 3 (outside the terminal) lounges. What’s interesting is that Plaza Premium seems to have a different focus for each one of their Heathrow arrivals lounges. 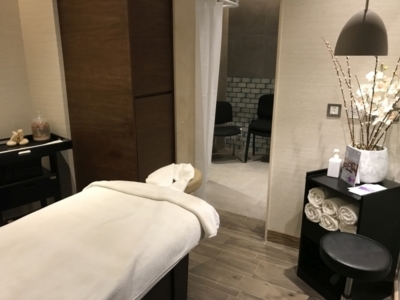 Whereas the lounge at Terminal 3 focuses on showers and a quick breakfast and the lounge at Terminal 4 concentrates on dining, the arrivals lounge at Terminal 2 is focused more on relaxation with a huge spa area. The lounge area seems very small with a bar and just a couple of tables. 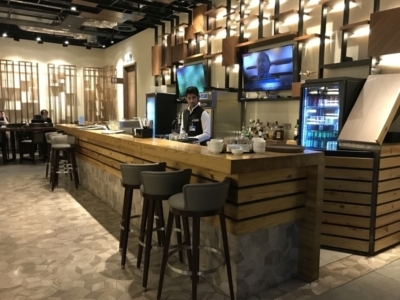 However, there is more on offer than it first appears – the bar serves a good selection of food to order as well as the expected soft and alcoholic drinks. The spa area is located behind the bar and can be accessed through a door next to the reception. There are 8 shower rooms and several treatment rooms which can also be used as day sleeping rooms. A 30 minutes massage for costs £45 whilst using the resting suite for 3 hours costs £60. The lounge is open from 5am until 10pm and access for 1 hour costs £25 (2 hours costs £35). You can pre-book via the Plaza Premium website here. It can also be accessed using Priority Pass or a Lounge Club card. You can also get in by showing your American Express Platinum card due to their deal with Plaza Premium, even if you have forgotten your Priority Pass. One off visits can be pre-booked via the Lounge Pass website. You can also use the lounge purely to take a shower for £15. The Plaza Premium Arrivals Lounge at Heathrow T2 looks worth a visit when flying into Terminal 2. The lounge is not the largest, but has a good food and drink selection as well as impressive-looking spa facilities. It is also potentially an option if you are picking someone up from the airport, especially if you have a Priority Pass, although the lounge has been asking to see a boarding pass at busy periods. This is not the case with the Terminal 4 or Terminal 3 arrivals lounges. After seeing all three Plaza Premium arrivals lounges, I’m now keen to see what they can rustle up for the – opening in just a few weeks – departure lounge in Terminal 5. You can find out more on the Plaza Premium website’s Heathrow page here. Any update when the T5 departure lounge will open? We were told Sep as recently as 2 weeks ago …. I’ve been asked for a boarding pass in all three of them when I made my lounge trip across Heathrow two weeks ago. At that time the lounges where virtually empty with me being the only guest in T3, one of three in T4 and maybe a dozen in T2. I was also in T4 on Monday and no BP was asked for. As a datapoint: I was asked for a boarding pass at T2, T3 and T4 in the past two weeks – even when the T3 lounge was empty! (3 people). I’ve also had times recently where I haven’t been asked in T2- generally though, I’ve been asked. Do they charge for any of the food and drinks, including alcohol? They charge for premium alcoholic drinks. The last two times I ate there I had terrible food poisoning. A colleague visiting a different time had the and experience. Needless to say I gave up on the place! Are we talking boarding passes for flights arriving into that specific terminal? No, any same day boarding pass is fine. I often use the arrivals lounge BEEFORE my flight. No issues. Ditto. Mostly because the T3 lounge offers a quiet room for making phone calls which is something that I’ve found difficult to find airside. I was on a BA flight into/from T5 and could get into any of the arrival lounges. It’s a different matter if you want ro access a departure lounge. If accessing with Amex Plat, do they just look at it? No, they swipe the card: and then they are prompted for the geographical issuer of the card (e.g. UK AMEX, Hong Kong AMEX etc). In some cases, the process of swiping the AMEX and choosing the origin/type of card took longer than the Priority Pass. Nothing appeared on my bank statement though (not even a ‘zero charge’) so I guess this is just some way of the lounge charging AMEX for access, or even just for statistical collection purposes if AMEX pays a lump sum per year for blanket access. I used amex platinum at Amex lounge in Delhi. was asked to verify with PINS entry and can see 2p charge on my card. In T3 they swiped my Amex and I was asked to sign on the screen. Never used arrival lounge before. My next return flight arrives at T5 (5am), too early for my train journey, so could make use of the arrival lounge. Would I be able to use arrival lounge at other terminals as there is none at T5? Found the answer to my question – seems to be ok to use lounge at other terminals if arriving at T5. Yes no issues. Tip is to take the connections lane when landing at t5 and transfer via the airside bus to t2 before immigration. You do not need a connecting flight. I eat lunch there quite often when I arrive. There are usually 2-3 starter, main and dessert options. Typically soup / salad then chicken curry, chicken stew and a veggie option. The service can vary greatly which is weird given there’s usually only 2-3 guests. I’ve lost count of the number of times that they’ve forgotten to bring water or tea over even though I’d happily wait at the bar for it. No food poisoning but they once conducted what sounded like a very aggressive exit interview with a member of staff right next to me. OT – Gatwick is packed on a Wednesday afternoon… have struggled to find a seat in the BA lounge! Is there any word on if the Premium Plaza T3 lounge is going to remain ‘as is’ or if they’re planning on doing any work? It seems so limited at the moment, and seems a bit out of place alongside the other two Premium Plaza arrivals lounges. I’d understand if the focus is simply on offering a light breakfast and a shower, which it certainly does offer – but it seems such a temporary setup, and the ‘poorer’ cousin of the other other two lounges. It seems in need of a refurbishment in order to bring it up to the standard of the other lounges, but I’m unsure if that is their intention. for clarity, I’m referring to the Premium Plaza Arrivals Lounge at LHR T3 (even though I don’t think that there is a Premium Plaza Departure Lounge at LHR T3). I can’t imagine this lounge makes a lot of money, even though there is only one person working there at a time. He told me they usually have about 10 guests per day. I recently used the lounge upon arrival at T2. Their ticket machine was not in action so my PriorityPass details were handwritten, I then signed it off and that was it. No questions or need to show any boarding pass. There is little to no self service but the staff are helpful.